These rustically beautiful Morning Glory Muffins are moist and super delicious. They’re also loaded with fiber – and lots of great nutrition! I love having a Whole Foods within walking distance of our home and find myself frequently wandering the aisles checking out all the wonderful ingredients. I’m always tempted when passing by the shelves laden with freshly baked muffins and the Morning Glory Muffins are definitely one of my favorite selections. They’re sweet, moist and filled with wholesome ingredients including fresh carrots, shredded apples, raisins, coconut, walnuts and whole wheat flour. But they’re quite pricey at Whole Foods, so I decided to do a little sleuthing and see if I could come up with a similar recipe. I found that Whole Foods actually has a recipe on their website for Morning Glory Muffins, but honestly, (don’t tell anyone I said this) they look kind of flat and dry. I decided to base my muffins on a recipe from King Arthur Flour instead. I adapted the King Arthur Morning Glory Muffins recipe a bit by swapping out dried cranberries for the raisins, exchanging pecans for the walnuts and leaving the nutritious (and pretty) red skin on the apples. Instead of adding the pecans to the batter, I used them for a “candied” topping. The topping is a simple combination of sunflower seeds, honey, salt and a few drops of oil. 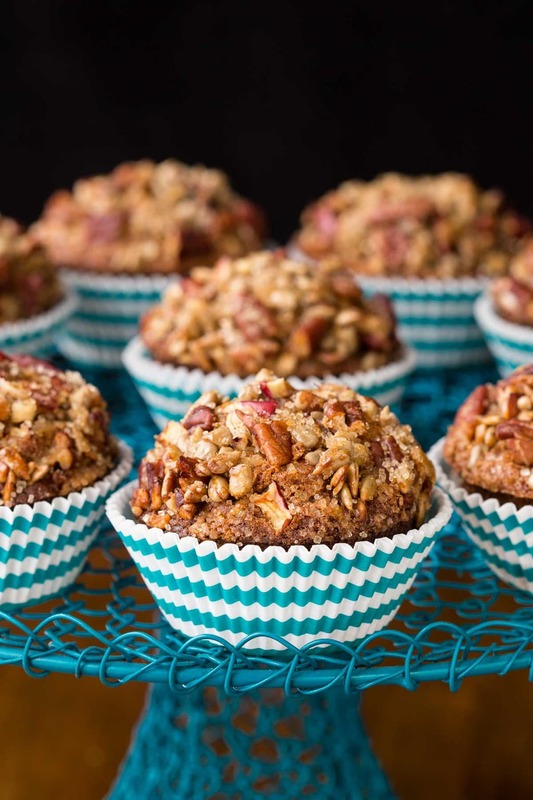 The topping adds a beautiful and delicious finishing touch to these wonderful muffins. 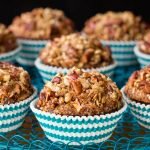 I serve these rustically beautiful Morning Glory Muffins frequently and it seems everyone always goes crazy over them. They disappear quickly and I love that they can be baked ahead and stored in the freezer. An overnight thaw or a quick stint in the microwave and they’re just like fresh baked. Because these muffins are loaded with fiber and lots of great nutrients, I find that one muffin keeps me satisfied all morning. I’m a happy camper when there’s a stash of them in the freezer that we can enjoy for a quick, decently healthy breakfast. The recipe makes more than indicated on the King Arthur site. The instructions are to fill the muffin cups “almost to the top”. I did fill them nice and high, but instead of 12, I was able to get 16 really nice-size muffins from the recipe. This recipe calls for whole wheat pastry flour. Whole wheat pastry flour is available at larger grocery stores, in bulk at Whole Foods and online. I’ve substituted white whole wheat flour for the whole wheat pastry flour with good results. White whole wheat flour has the same nutritional value as regular whole wheat flour but it’s a little lighter. It’s available at most larger grocery stores and online. Use a BIG bowl when stirring together these muffins. There are lots of ingredients! To make things super easy, I often purchase packaged shredded carrots for these Morning Glory Muffins. For the topping, I use a sprinkle of turbinado sugar. You could also use demerara sugar or raw sugar which are both similar. You’ll find most of these specialty sugars at larger grocery stores in the baking aisle along with the regular sugar. I like to use sunflower oil when baking, but any neutral flavored oil will work fine for these Morning Glory Muffins. If the muffins are getting too brown after 20 minutes, cover them lightly with foil for the remainder of the baking time. This recipe can be also made with zucchini and fresh pineapple. I love making these Zucchini Fresh Pineapple Morning Glory Muffins in the summer when zucchini is abundant. Whip up a batch of these delicious Morning Glory Muffins. I call it a “no fail” recipe, as every time I make them, they come out high-domed, beautiful and super moist. I think you’ll agree and these muffins will go into your favorite recipe collection! This recipe was originally published back in 2015. There are so many new readers and this recipe is too good to be buried in the deep, dark Café archives. We’ve spruced it up a bit and are sharing it again for your baking pleasure! After you make these Morning Glory Muffins, please come back and leave a review. It helps other readers to hear your results. I always love finding a recipe with lots of real reader reviews! This is one of those "never-fail" muffin recipes that everyone loves. They are delicious; but also loaded with healthy ingredients. The candied pecan topping is the crowning glory! Preheat the oven to 375°F. Lightly grease 16 muffin cups* or line them with papers. Line a sheet pan with foil and spray lightly with cooking spray or rub with a paper towel and a bit of oil. Combine pecans, sunflower seeds, honey and olive oil on the prepared sheet pan. Place pan in preheated oven and bake for 4 minutes. Stir to redistribute and bake another 2-3 minutes or until pecans are light golden brown. Remove from oven, spread apart and set aside to cool. In a large bowl, combine the flour, brown sugar, baking soda, spices, and salt. Stir well. Add the carrots and coconut, apples and dried cranberries. Stir and then run your hands through the mixture, breaking up any small clumps of brown sugar, coconut or cranberries that remain. In a separate bowl, beat together the eggs, oil, orange juice and vanilla. Stir till smooth. Add egg mixture to the flour mixture, and stir until evenly moistened (mixture will be quite thick). Divide the batter among the cups of the prepared pans, filling almost to the top (about 7/8 full). Divide the candied pecan mixture over the tops. Sprinkle each muffin with about 1/2 teaspoon of Demerara sugar. Bake the muffins for 25 to 28 minutes, until they're nicely domed and a cake tester inserted in the center comes out clean. Remove from the oven, cool for 5 minutes in the pan, then remove from pans and cool on a rack. Wrap any leftovers in plastic wrap or a zippered storage bag, and store at room temperature for up to 24 hours. Freeze for longer storage. See Café Tips above for detailed instructions and additional tips. Hello. 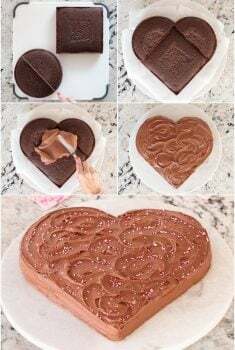 I was out today and had to come home to let you know I have made this recipe twice so far and will be making more again tonight for a friend’s birthday. Every time I have made them I had gotten such great reviews and two people so far said they are the best muffins they have ever had. Of course it does take assemble, but they are so worth it and are great to freeze. I added orange zest in the dry ingredients and pumpkin seeds on top. I am sure I can come up with other variations but wanted to let you know your recipes are a class act. I’d like to make this tomorrow, but …. 1/2 t. “cloves”? Ground? That’s a lot of cloves; very strong. Is that a typo? Yes, it is 1/2 teaspoon ground cloves. The clove flavor is not overpowering. I made these for my teams at work and they were a big hit. I did change a couple of things to use what I had. They were worth the effort. Yay! So happy you enjoyed them, Ginger. 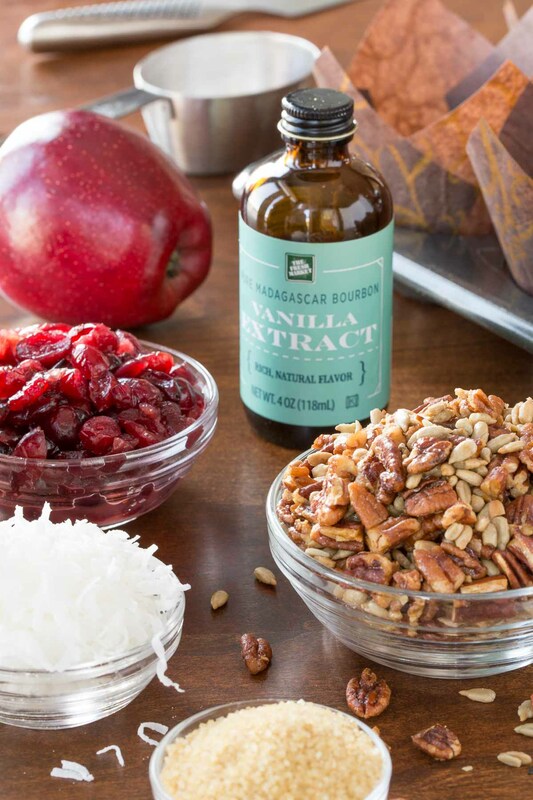 They’re one of our favorites and I love all the healthy ingredients! I just made these and they’re great! I used Kroger white whole wheat flour (didn’t say pastry, but they turned out wonderful). I didn’t have the sunflower seeds so I just used more pecans, which is never a bad thing *grin*. The rest was as is. I got 18 out of mine and they were still very domed. I may try the maple syrup for the topping like someone else mentioned-sounds good. I almost peeled my apples, I was afraid the skins would be a problem but I didn’t and they weren’t. It was much easier also not to have to peel. I will definitely make these again. Thanks! Chris, these are absolutely delicious. I made them for my fellow precinct workers at the polls on Tuesday. For an added treat, we awarded our first time voters and the # 100 th voter one of these home baked goodies! They left our voting place with major grins on their faces! Morning glory muffins happen to be one of my favorites too Chris! And that candied pecan topping sounds fabulous!! 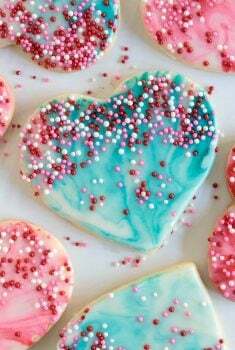 Getting these on my baking list soon! These muffins are AMAZING. instead of oil on the topping I used maple syrup, worked very well. I doubled the spices as I prefer a kick. It made a sort of gingerbread flavor which all my neighbors and friends loved. I didn’t have Orange juice so I used pineapple. I will make these over and over. Yay! So happy you enjoyed them, Debbie! And thanks for letting us know! hi again thanks for replying about how to blend just a tip your receipe unlike some others does not say to reduce oven temp to 350 , i did cover with foil and while the seasoning was yummy they seemed to be overcooked at in my convection oven should i bake on regular bake? Hi Diana, I have convection (and love it!) but always use the regular baking setting because so many people don’t have convection. I want my recipes to work out well for the majority of readers. When using convection, you do need to lower the temperature. And every oven is a little different, even with the regular baking setting. Because of that, whenever I use other people’s recipes, I always set my timer for 5 minutes less than the called for time so I can see how things look. Wish I had yours under my dome instead! Discovered pecans only a year ago and love them, of course, every way ! These are perfect for a working day to take with me and have my to go breakfast wit coffee ! Thank you ! These look dreamy! I’ve always loved a morning glory muffin and always add dried cranberries instead of raisins, too! I wish I could join you for a cup of coffee and one of these gems! Hi Diana, I don’t for these muffins, they’re super easy to mix up with a bowl and a spoon or spatula. 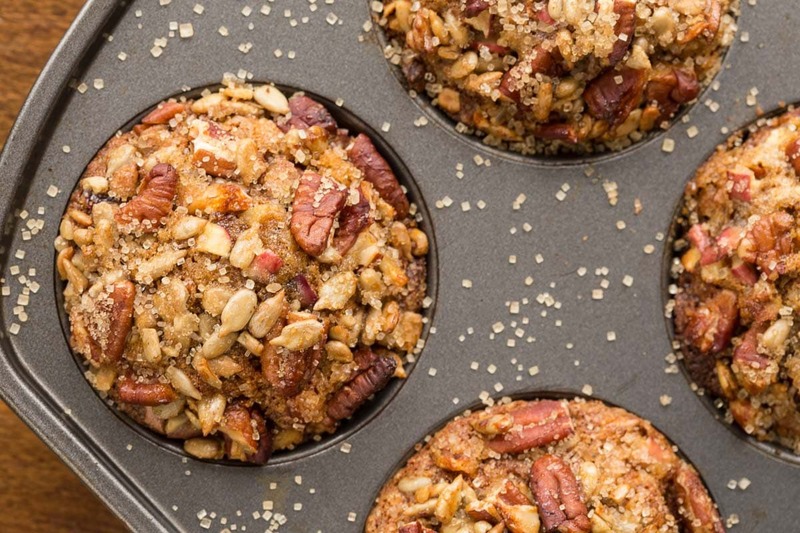 I love a muffin in the morning, but I love a LOADED muffin even more, these look spectacular! Used what I had on hand – walnuts and flaxseed for topping and canola oil for the vegetable oil. Substitutions were very good – will buy ingredients needed for next time. 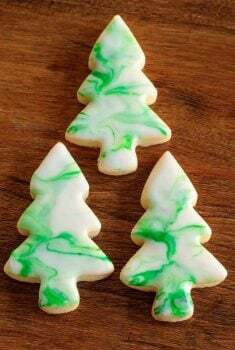 I made them the first time and they were a little dry – so I reduced the oven to 350 and watched them carefully when I made them today and they were better. I have been looking for a morning glory muffin recipe – I love the muffins at our Amish market. . This is very close! I am a big fan of your site. Five Star – Excellent recipe – thanks! I have a few favorite sites that I check for recipes, yours is now one of them but what I want to comment on is that I also go on Google images and search for a recipe and start with pictures. I can’t wait to try each of your recipes, I’m disabled and because of some transportation issues right now it may not be until after the first of the year before I can try them all, each of them look delicious and I to like to make it ahead and freeze to enjoy when not up to cooking etc.Thanks for shareing the recipes if they taste half as good as they look.,they look great way better than the picture you shared from whole foods and King Arthur. We don’t have a whole foods close by, I have used King Arthur flour, yours look 100 percent better than any of the 2 pictured, thanks again for sharing.Pray that you and your family have a wonderful Holiday Season. Merry Christmas and Happy New Year. So glad you’ve enjoyed the recipes Barbara! 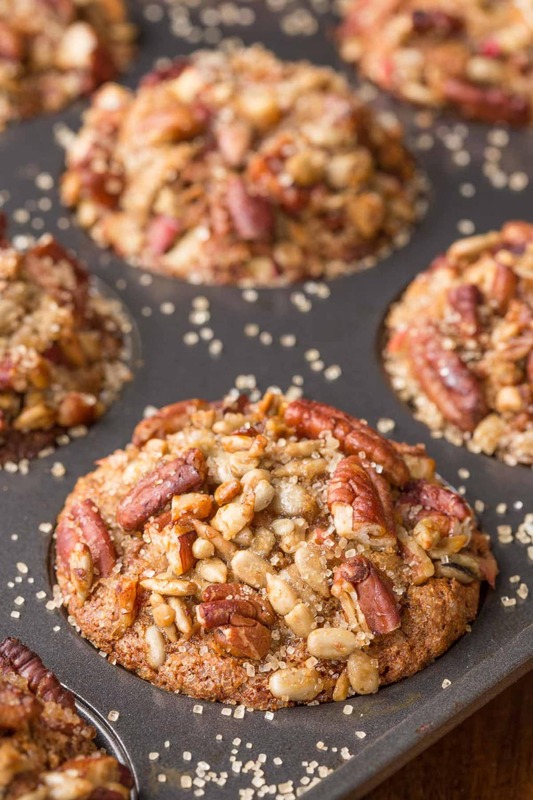 We love these muffins, they are so filled with healthy stuff and are very easy to put together! Once again I like your recipe! 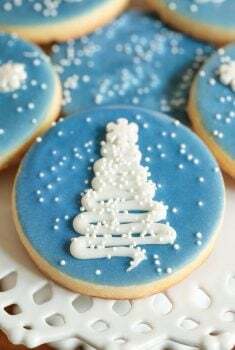 I also use the King Arthur web site and order all my baking ingredients (especially vanilla, baker’s special sugar, and and their white whole wheat flour) some of my bake ware from them. You can’t beat them for quality. I’ve used their recipe for Morning Glory Muffins before and it works just as you report. However, I do like the ammendments you have made and will continue to make these muffins according to your recipe.